Chicago, Ill. – July 2, 2018 – The Midwest Collegiate League has announced its weekly award winners for the week spanning June 25 – July 1. DuPage County outfielder David Giuliano (Downers Grove, Ill. / Cornell University) has been named the MCL Player of the Week, while Northwest Indiana right-handed pitcher Christian Howell (Trinity Christian / Aurora, Ill.) has gained the league’s Pitcher of the Week honor. Giuliano had a monster week for the first-place Hounds, going 13-for-21 with four doubles, seven runs scored and six RBIs. He has enjoyed seven straight multi-hit games and leads the league with a .451 batting average to go along with a .521 on-base percentage. Giuliano’s biggest day of the week was on Sunday, when he totaled six hits (four in Game 1) in a doubleheader split with Crestwood. Howell moved his record to 4-0 in Game 2 of Northwest Indiana’s doubleheader sweep of Joliet on Sunday. He scattered just three hits over six scoreless innings while racking up 11 strikeouts and issuing no walks. The 11 strikeouts were one shy of matching the Oilmen single-game record, set last year by Max Franklin. 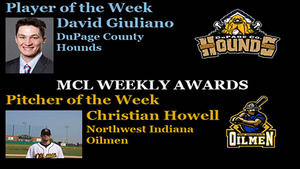 Howell becomes the first Oilmen player to gain MCL Pitcher of the Week accolades this season, while Giuliano becomes the second Hound to win the Player of the Week award.